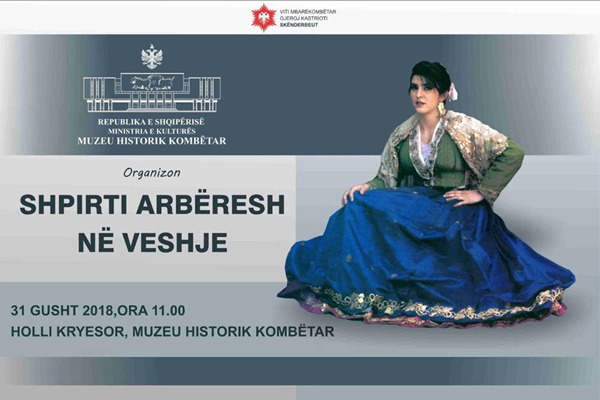 On the framework of Skanderbeg’s Year, the Albanian nobleman, the National Historical Museum opens a public exhibition entitled "The Arbëresh traditional costumes in different periods ". Costumes presented include the history of the Arbëresh’s of southern Italy describing the soul of people who have their own cultural identity. The exhibition reflects the seven displacements of Albanians, according to certain periods. Costumes are a "symbol status" of the social environment, they unite and equate people. Dolls, miniature models, witness the Arbëresh culture. Simplified in their processing, they offer ethnologists a field of research on the ancient dress of Albanians. Women's clothing has presented an element of pride in the history of our people during the darkest moments of history. The functions that carry these traditional costumes are different and show the social order, age, class, work, mourning, representation of religious belief, and the fact that a person is single or married. The Arbëresh-style dolls bring an image of peace and brotherhood to both peoples whose shores lurk in the same sea.